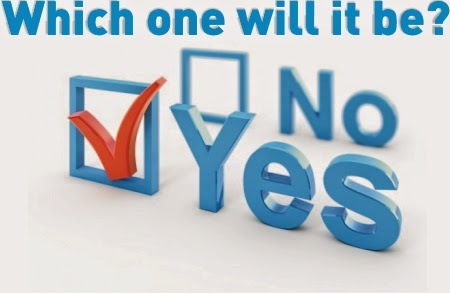 WordOfGraceChurch: Which one will it be?Yes or no? Which one will it be?Yes or no? Church- Is it even worth finding out about? Paul in Ephesians gives us a high view of church. If creation is the wheel, the church is the HUB. The manifold wisdom of God is demonstrated through the church. When you come to the Life Group, Church you are entering into the center of the universe. A community on a mission – not just a family or an army. But a family that is an army on a mission. God sent Jesus on a mission, to rescue us. We are on a mission to help people cross that line of faith. Is 54 – A church should strong and long, ever growing. God wants to build community and to make us one. Not just that, but to make us GO – to the ends of the earth. We need to be a strong community and going community. The Apostle write a lot about strength and about going community, Paul wanted to go to unreached regions i.e your neighbor, your office colleagues. We see it in Acts – the richest community life, looking after one another, sharing stuff, and money food but on a mission. But this is fraught with challenges, in the OT and the NT . Nehemiah experienced this too. He rebuilds the wall using family units - he wanted community doing the mission. Jesus himself at his most poignant moment on the cross felt neglected. Other problems faced by the NT churches and that we could face. When we have growth and there are strains and tensions. Acts 6 The mission was going so well that it took a strain on the community. There could be a lack of leaders, life groups, and musicians. Theirs was food. etc. The leaders gathered and said the solution is not to stop mission. “Ministry of the word of God” i.e. the advance of mission happening not just Bible teaching. They came up with solution – chose 7 men from among you. The result is the number of disciples increased rapidly. When they strengthened community the disciples increased. When you grow there are tensions, and some feel neglect especially the older ones. We have to be a warm loving community. Church will be done differently because culture is changing. The message never changes. We are here to make not yet Christ followers become Christ followers. 1. Not right to stop mission. We are not a hospital though we care for you. When you are needy we put you on a mobile stretcher and care for you while we keep moving. 2. Increased honesty – they complained. This is good. It’s ok to say you are not doing well at all. Get help. You may be complaining about yourself or the church. We are not perfect. Complain with a good attitude if you can, complain with a bad attitude but let us talk and know what you are passionate about. Sometimes we will take your suggestions, and sometimes we may not. What you must not do is seethe because you will blow up. 3. Increased Organization. Its not an enemy to church life. We do not want to be too organized either. We may drop the ball here and there but we want to be organized. 4. Increase the number of leaders. Jesus said that the harvest is plentiful but the laborers are few. There is no problem with the harvest but with men and women not stepping up to take responsibility. The harvest stays unharvested because there are no leaders. God will not give us more harvest if we don’t grow more leaders who will train others and become fishers of men. This is critical. Whether we go or stay we are all on mission. WE need more leaders why? We need pastors – one analogy is we are a flock. You may say I can never be a pastor. If you care for people you are a pastor It is loving and caring for people, not about using the microphone. It’s helping shepherd develop and love – that’s what a pastor is. WE need more leaders and pastors. There are different kinds of pastors – some do it one on one. Leaders are critical for community and for mission. You don’t get advance without leaders. WE don’t get advance without leders breaking rank and saying “I’ll do it”. When you take lead out of leadership we get “er”..!!! We always need to go for three times the number of leaders. To grow, and to give away. Are you involved or committed. The chicken is involved the pig is committed. When you do this you move from “that church” to “my church” from them to me. A man can’t really live unless he find a cause to die for- Martin Luther. We have a cause to live and die for!!! WE are here to plunder hell to populate heaven. Can you learn to say “YES”. When you say “no” let it be a considered no with a clear conscience. But be in the habit of saying “yes” to God. Saying yes to God often comes through requests that come from your leaders. God will give you strength and grace and your spiritual muscles will grow and your joy will increase as you do the good works you were meant to do. 6. Increased faith – for one another. I believe that you can do it because God is amazing and God is in you. We must have faith for one another and spur one another on toward love and good work. Have faith for your local church mission. This is not just for the leaders and some. But, for YOU as well. God responds and honours faith. If we have corporate collective faith it moves God’s arm. God loves faith so stir it. When wind blows on a field of wheat all the stalks sway in the wine. When Gods word comes we all should respond. 7. Increased Spirit – The spirit comes to empower, joy to obey and makes us sensitive to know who to talk to. Also we all don’t need caring for all the time. Some need it at specially times and we need to ask God to show us who needs special care. 8. Increased hospitality – This is very basic to being a Christ follower so much so both lists of what a church leaders should look like has hospitality on the list. If you don’t get how hospitable God is to you, sought you out and took you into his family, if you don’t practice it, you need to check how much of a Christ follower you are. It’s about opening your home up. How many people do you have in your home? Something great happens when you open your home up. Hospitable – listen more; give yourself even if it’s for three minutes after the meeting talking to someone new. It’s about where you are sitting now – where your church meets on a Sunday. Your meeting place is your personal lounge and we are a family. This is our home so we should feel relaxed and make people feel at home. There are new comers and we should be very alert to them. Are we late when we have visitors at home? No that would be inhospitable. So we want to be here at the meeting before your visitors come in so you can welcome them. Be open and look out for them. Then there will be a strong community and mission vibe. If you are shy still do it. God was not shy with you. Do it your way but do it. We are God’s solution along with other local churches in this city for any problem any person has a high view of church – a community on a mission. 1 What is your view of Church? How does it fit in with this view expressed here? 2. Do you feel you are well connected to the community here? Have you seen your neighbourhood, job etc as a mission field? Are you reaching out to people there? 3. What are the strains and tensions of growth at Word of Grace ( ask this of your local church)? 4. What do you feel you want to complain about but have not done it yet? Can you talk to one of the leaders please? 5.What responsibility am I carrying at Word of Grace. How am I serving? Has your default been “no” or “yes”? Can you say “yes” more? Is this “that church” to you or “my church” ? 6. How can we express corporate faith better? How can we grow in being sensitive to the Holy Spirit? 7. Are you are harvester in God’s mission field? Who are you caring for in the community? 8. Hospitality- What are your thoughts on this? Have you received hospitality from Word of Grace? Are you practicing hospitality? Is your home open? How many people from church have you invited to your home in the last 3 months /ever? Singles have you taken any one out for a meal/coffee? Are we welcoming to first time visitors – do they feel welcomed, cared for? Have you made the effort to invite them to your home? Are we welcoming to people new to the city: do we help them settle in and feel welcomed? One way is to get their contact number so maybe you could catch up with them mid week. At the church meeting: Are we on time to the meeting to welcome our guest or are we habitually late for the meetings?